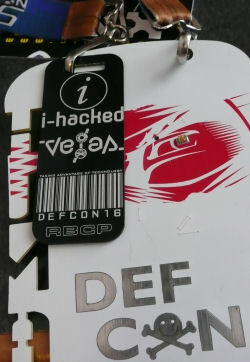 I went to Defcon this weekend. I left for the airport Friday morning and hung out there for a few hours. I stopped at an ATM to take out $300 for the weekend and the machine only gives me $280! I always thought it was stupid to count the money because ATM machines never make mistakes like that, right? But yeah, it kept $20 of mine. It was a U.S. Bank ATM so I called them and they told me to call PayPal since that’s the card I was using. PayPal emailed me a chargeback form, so hopefully that works. I’m not counting too much on getting my $20 back though. I sat to the most talkative girl ever on the plane (really, she just went on and on and on to me.) and got into town just in time for rush-hour traffic. Arrived at the hotel and bumped into el jefe about 5 minutes later. Had drinks for awhile, then set off to find RijilV and Co. He was awesome enough to somehow get me a free badge so I didn’t even have to wait in line or pay. We ate at Peppermill, I gambled $5.00 because Spessa ordered me to. I also have to share my winnings with her, which comes out to $0.00 each. We walked all over Vegas for an hour or two and then went back to the hotel. On Saturday I woke up around 10am and walked to 7-Eleven for breakfast. I tried Dennys first, but there was a line out the door, so I settled for Hostess cupcakes and milk. I ended up trading 2 PLA t-shirts for other shirts that were being sold in the vendor area, which has always been my way of saving a few bucks at Defcon. Set out PLA stickers, media DVDs and business cards on an empty table. I also got the guy at Sticker Nation, who had a bunch of buttons on his table, to take a bunch of PLA buttons and sell those too. I think I gave him about 30 PLA buttons. Thanks, Sticker Nation guy! At some point during the day, I was walking alone and someone passed me and yelled, “PLA!” Then someone walking behind me yelled back at him, “Cactus cactus!” As I rounded the corner into another hall, I looked back at him and told him there was no cactus here. He ended up telling me that he found the PLA when he heard it mentioned in a Nerdcore song. It was, of course, Trevelyn’s song called Blackhat Life where he mentions PLA Radio. This guy wondered what PLA Radio was, so he Googled it and seems to know a lot about us now. So thanks, Trevelyn, for bringing even more hapless people to the PLA. Met hevnsnt from i-hacked.com and a bunch of other people in their Skybox. Went with RijilV & Co. to the Star Trek ride which was a lot of fun, even though I’m not much of a Star Trek fan. Was a really great ride, though, and I can’t believe they’re going to tear it all down after this summer. Ended back up at the i-hacked.com Skybox a few more times and watched their live podcast. Hevnsnt gave me a cool badge with “RBCP” laser-etched into it which gave me a few free drinks. Drifted between the i-hacked party and the 303 party for several hours and met a ton of people that I hadn’t seen in years or that I’d never met in person before. One of those people was Skydog from Phreaknic who luckily didn’t punch me in the face for my phone stunt at the last Phreaknic I attended. He told me all about how he was on the floor, under their PBX system, trying to figure out how we’d messed up their phone service. He said I’m allowed back, but I have to be punished publicly, or something like that. I met Grey Frequency too! I didn’t even know she went to Defcon so that was unexpected. I woke up pretty early on Sunday but didn’t feel tired for some reason. So I showered and got ready to wander around the hotel. But midway through shaving, I suddenly felt really sick and wanted to pass out and/or puke. I barely made it out the bathroom and fell back to the floor to sleep for a couple more hours. I think it’s been about 5 years since I was hung over. I got up later and went to Denny’s for breakfast. Felt a lot better after that. Attended a lot of talks throughout the rest of the day, mostly just so I could rest.